Steamed mussels in a ginger, fennel and tomato sauce have just enough spice to give them a flavourful kick. There’s nothing like the freshness of fennel and ginger, especially when they season the tender meat of mussels. Serve this delicious seafood dish with a crusty bread. Heat the butter in a saucepan and stir in the spring onions, fennel, ginger and garlic. Fry until slightly tender, about 2 – 3 minutes. Stir in the stock and tinned tomatoes. Bring the sauce to a boil and allow it to simmer and reduce slightly, about 10 – 12 minutes. Season with salt and pepper or a splash of fish sauce. Add the whole vine tomatoes and cleaned mussels. Put the lid on and steam until the shells have opened, about 3 – 5 minutes. Discard any mussels that remain closed. 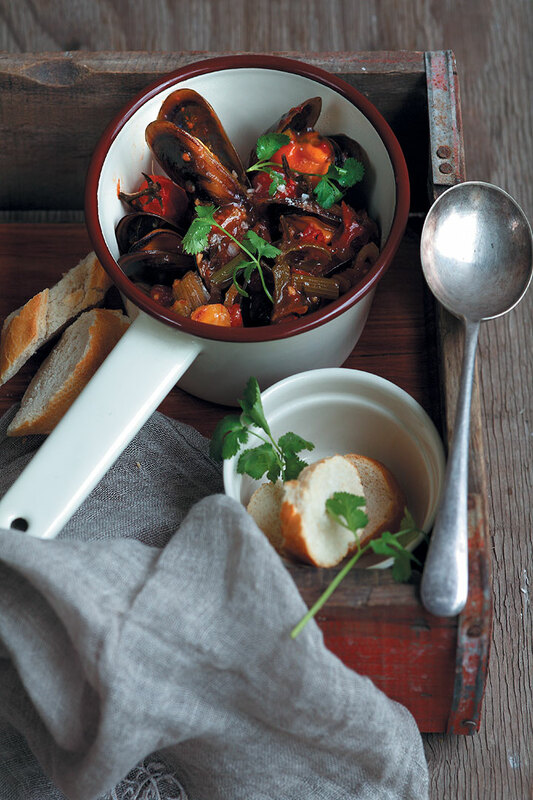 Serve the mussels in the sauce, scatter the coriander leaves on top and add crusty baguette slices on the side.